One way to enable this high level social atmosphere is by allowing users to ‘bump’ or upvote posts and/or join the conversation. ‘Bumped’ posts are tallied beneath every posting. Users can easily follow their friends and other users they find interesting to keep up with their activity on the site. They’ve started out with communities for the NFL and College Football. 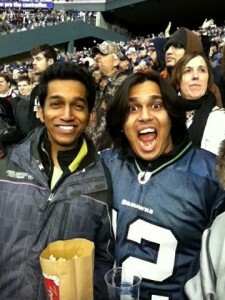 Vinay and cofounders Arka Ray and Marios Assiotis are certainly Sports Techie at heart. These three have long term company vision and are not operating under a quick exit strategy for Sidelines. They have previous work experiences at Amazon and with Microsoft Xbox and Hotmail. All three earned Computer Science degrees from either UC Berkeley or MIT. They love sports such as football and F1 while taking personal time to snowboard and ski. Each is a fellow Seattle Seahawks fan who like me had the opportunity to attend the epic NFL playoff game versus the New Orleans Saints at CLink when a Beast Quake shook the stadium and earth. Even though we have not met in person I do feel ‘Sports Techie energy’ flowing from these guys. By the time the three decided to formalize this business arrangement, two had expired works visas needing renewal. With the support of a Seattle attorney and venture capital firm, the team’s case was presented to immigration officials and they won. Rather then send text messages, GroupMe, Twitter and email threads, Sidelines friends discuss sports and share sports-related memes, videos and articles inside an environment that is managed by four hired Moderators who constantly review content and start threads. Aspiring sports writers who want to get exposure are the kind of Moderator and Super User candidates the company wants to uncover in a win-win relationship for each. By the time a certain user threshold is achieved of 20,000 to 50,000 active users cash Moderators will no longer be needed, instead a self-policing culture will morph into effect to help keep inflammatory or spam related posted off the site. Badges and swag type rewards are trade offs users can claim for their help keeping banned content off posts. Vinay felt there is a sort of ego boost involved with assisting to make sure things are right. An example of another company who has had success with this tech business model is Reddit. Signup was easy but requires a Twitter or Facebook login. I am user name, SportsTechie. You are asked to pick three teams to start and since they are beginning with NFL and NCAA College Football communities only, I selected the Seattle Seahawks, New York Giants and Michigan State Spartans. You are asked to ‘Grow Your Network’ and give them one friends email address as a requirement however this part of the setup process can be skipped. Once completed you will receive a confirmation email. After this last signup step the process is complete. Look for a follow up email from Sidelines Community Manager, Rachel Hill. The web site interface is simple and comes with no adds. I like how NFL game recaps and scores with upcoming game info is included on certain pages. Not a big fan of being asked to increase my followers but it does not hurt to ask. Their auto-recommend feature is helpful for finding people to friend who matchup with your profile. Vinay and his team have constructed an ecosystem they feel is a difference maker. Sidelines answers to why they are unique below. The founders have working on creating a stand alone business that also helped keep the founders in the U.S. on work visa’s. They feel like a role model for other entrepenuers who face similar USCIS issues. After a certain level of growth, Vinay feel they can, “cross-promote with other brands.” By the Fall of 2013, Sidelines will expand to other topics such as the NBA. To get an idea of what the scope of the U.S. market looks like for Sidelines check out their topics web page: http://sidelinesapp.com/topics. Expansion means migrating to Europe for popular topics and events like the Premier League and World Cup for soccer and the Tour de France for cycling. Localization in Spanish or French are a part of these growth plans. Adding valuation is a fundamental principle the company adheres to. Marketing has consisted of contest giveaways for a free Kindle Fire in order to help increase their user base numbers. Users who take a leadership type roll have been awarded an iPad. Sidelines are using promoted tweets, SEO and Google to ramp up their search for new users. The current marketing step involves talking to blogs and web sites to help get the word out in addition to the continued mining of other fantasy sports forums and newsletters for customer leads. Before they create an actual mobile app they plan to hit a critical mass of users first. After the web site starts to pop, Sidelines plan is to target mobile devices with their own native app. Vinay repeated that their business model is, “Highly monetizable.” I asked him whether that involved Fantasy Sports? He was not able to talk about their anticipated monetization in detail however he was confident that it was doable according to their business plan. Sidelines is self funded and not looking for investors quite yet. As with anything else on the Internet, familiarize your Sports Techie self with the sites terms and conditions. For instance, Sidelines does not hold themselves responsible for bad links. Ownership of opinions, content, photos and pictures are user rights to clearly understand before posting your own stuff. Sports Techie, Fandom is fanatical and has various levels of expression which is why I like Sidelines attempt to be THE online chat type fan forum for higher level conversations of all generic sports. Keeping conversations at a high level was exactly my role as the Moderator for the NY Giants, Houston Rockets and DWTS wiki before launching Sports Techie so I have some insight as to how this will or will not work as a sports business. As long as Sidelines can hire top Moderators who can grind out premium content and keep posts fresh and clean on a daily basis, it is on the way to being a winner. Sidelines beta launch over the next several months is focused on creating a buzz by having others talk about them and by gathering critical user feedback. Try using Sidelines as a second screen during the upcoming NFL playoffs and NCAA Bowl games. Sign up at the web site link and help my fellow Seattleite Vinay, and his sports business partners in San Francisco and Vancouver, make their dream for Sidelines App come true.